A major magnesium silicate producer tested FMX technology on an industrial scale demonstration to maximize the recovery of magnesium silicate in it’s wash water. Achieve maximum recovery rate of lost magnesium silicate in the wash water and concentration of recovered magnesium silicate slurry to be blended back to manufacturing process, while producing suspended-solids free permeate for further RO treatment for water recovery to reduce surcharges for wastewater treatment. The waste stream from processing the silicate slurry was continually fouling RO systems. Over the four weeks, the FMX-E5 pilot unit was able to maintain the desired performance that was determined during previous in-house testing. 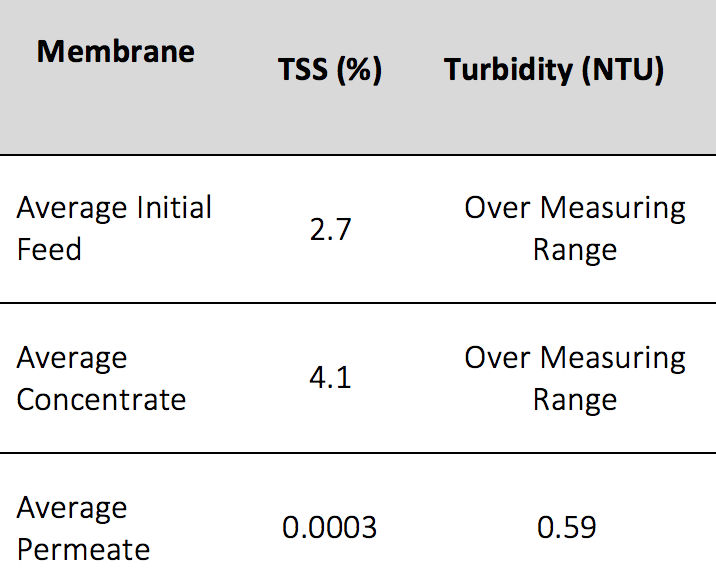 The sustained performance of the membrane filtration media to process the application-specific influent stream over a prolonged process time verifies the feasibility of the FMX technology for use in this application.